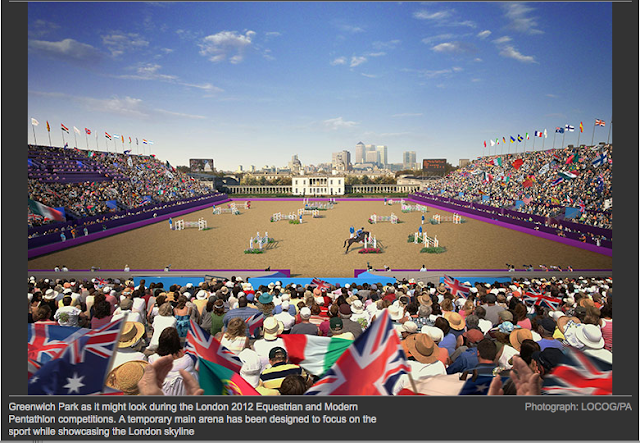 The London 2012 committee has recently released artist's renditions of three of the London 2012 Olympic venues. One of those revealed is Greenwich Park. What is remarkable is that this facility is temporary, something that was promised by the committee to the people of Greenwich. This promise was secured by Greenwich in order for the London 2012 committee to gain Greenwich support for venue placement. The Greenwich citizens wanted no "White Elephant" remaining after the closing of the games. It is remarkable that a facility as large as this can be engineered from temporary grandstands. If it looks anything like the artist's rendition, we say well done!